The world’s leading manufacturer of consumer drones has announced a brand-new accessory for its latest Mavic 2 Pro and Mavic 2 Zoom drones. Called the DJI Smart Controller, it boasts a Full HD (1080p) 5.5-inch display that has a 1,000 candelas per square meter output. That means it’s twice as bright as the average smartphone screen (which you can plug into DJI’s previous controllers) and will let you see anything even in bright sunlight. While the addition of a screen on a drone’s controller has its advantages, it comes at a cost. DJI has slapped a premium price tag of $650 / £579 / AU$1,099 on it, and it's already available to buy on DJI’s own website. The Smart Controller uses DJI’s OcySync 2.0 video transmission technology to display a live view of what the drone is seeing on the screen. It’s also able to automatically switch between 2.4GHz and 5.8GHz to ensure you receive a steady feed over long distances – the controller has a range of up to 8km (4.97 miles). 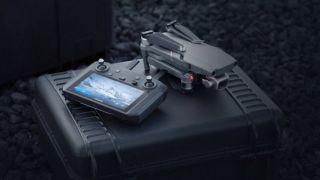 It’s also been designed to withstand the elements, being able to function in temperatures ranging from -20 C / -4 F to 40 C / 104 F.
On screen you’ll find a customizable Android dashboard that supports the DJI GO 4 app, along with DJI Pilot and other third-party applications, including editing software. With the DJI GO 4 app on board, you’ll be able to live stream your drone’s camera feed to social network platforms via SkyTalk. However, DJI hasn’t clarified which version of Android the controller runs. The controller also supports microSD UHS-I Speed Grade 3 cards up to 128GB, and there's an HDMI port with 4K video output support, a USB type-C port and a USB-A port. All this, though, needs a pretty hefty battery. DJI has packed a 5,000mAh battery under the hood and claims you’ll get 2.5 hours out of each charge. That may or may not be enough, depending on how many extra batteries you carry for your drone. For its high price, though, 2.5 hours does seem a little low. However, it does support QC2.0 quick charging via the USB-C port.